With such a vast range of registrations available, our number plates search box enables you to match a word, name, initials, numbers... anything! Find your ideal number plate, and then use our vast experience to make sure the actual transfer happens as smoothly as possible. We also have an experienced sales team manning the phones as well so give us a call if you would like to discuss any of the number plates search results. Select from the available drop downs, then search for reg that match the pattern you've built. Single letter, 1, 2 or 3 digits, three more letters. Two letters, 2 digits, three more letters. Why buy a number plate? There are a huge number of reasons why you might be looking to buy a personalised registration. Many are bought as gifts - As truly unique items, they make excellent birthday and anniversary presents. Matching a year of birth with some initials, or a name/word that holds significance to the recipient means you can give a present that is thoughtful and different. To put a personal stamp on your vehicle - There's no other accessory that you can add to your vehicle to make it more personal than a private number plate. Whatever you choose to represent on your reg (perhaps it's your initials, an important date, or show that you're a supporter of a football team), with over 54 million registration combinations available, there's sure to be something that matches your budget and requirements. To promote your business - If you own a fleet of vehicles, displaying a run of sequential registrations on your vehicles is a great branding exercise. Or sourcing plates that relate to your particular industry - the classic example being that of Pimlico Plumbers whose vehicles have all sorts of plumbing related reg on them A1 EAK, 701 LET, 84 THS and so on. If you can prove to your accountant that the registration is a legitimate business expense, you can also claim the VAT back on your purchase! As an investment - Certain registrations have proven to be very sound investments. Whilst many will at least hold their value, if not increase in worth, buying the right reg can return a very tidy profit if you sell it later. Unlike other forms of investment you get the bonus of being able to enjoy the registration on your vehicle whilst waiting for the right time to sell. Or just to show off! - America coined the term 'vanity plate' for their personalised registrations, and with good reason. If you're into turning heads, then a custom reg plate is an excellent way to get people's attention. And why not? How do I buy a number plate? Buying a number plate from National Numbers is very straight forward. First, you can use our search to track down the registration you're interested in. If it's available to buy online, as the majority of the 54 million reg on our books are, you can make a purchase immediately! Supply some contact details, the name of the person you want the registration assigned to (this may be yourself, or if you're buying as a gift for someone else, their name - it just needs to match the name on the V5C log book for the vehicle you'll be putting the registration onto), and provide payment (all securely). Congratulations! You've just become the owner of your very own personalised registration! It's that simple. Most of our registrations come with 0% finance options, meaning you can spread the cost of buying your ideal reg. If you take up one of our finance plans, we ask for the same information as above, take a deposit and then pass you over to our partners - Hitachi Finance - for you to complete their application. You get your registration and make the monthly repayments back to Hitachi. Again, super simple. If the registration isn't available to buy immediately online (this typically means we are in contact with the current owner and will first have to reach out to them to confirm pricing/availability), or if you'd simply rather speak to someone about your purchase instead of buying securely online, then we have a team of friendly sales advisors who will be only too happy to chase registrations and answer your questions. You can reach them on 01642 363738. Buying a personalised registration isn't an everyday occurance for most people, and sometimes it means parting with a significant sum of cash to secure the reg. So what makes National Numbers a company you can trust to do business with? We're recognised by the DVLA, and are members of both the Cherished Numbers Dealers Association (CNDA) and Retail Motor Industry Federation (RMI). We're rated as 'Excellent' on Trustpilot with over 1525 reviews, scoring an average of 9.6 out of 10. And we have one of the largest databases of UK registrations - some 54+ million registration combinations - covering unissued Government stock, registrations from private sellers and our own large range of stock plates. If we don't have it, it's likely not available! Having been doing this for so long, we've seen and adapted to a huge number of changes in the industry during that time - in short, you can be confident we know what we're doing! We pride ourselves on customer satisfaction, as evidenced by our TrustPilot score; are members of the industry's leading governing bodies; and offer secure online payments and 0% finance plans on many of our registrations. Registrations from only £136! Limited stocks and selling fast! Enhance your vehicle by adding the most unique of accessories! Registration plates with a patriotic theme. Connected to the IT industry? We've plenty of TLA's to suit! Fast motor? Show off the power beneath your bonnet with a customised registration! Freshly added reg! 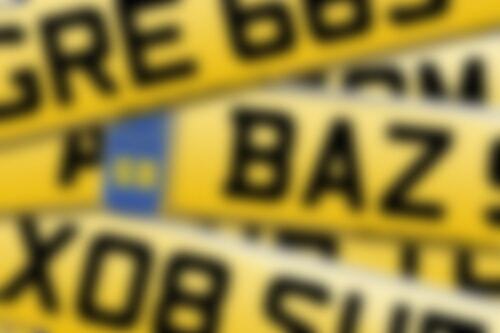 Number plates most recently added to our site. Football registrations for all divisions. Animal lover? How about a reg showing appreciation of your furry friend? Single letter registrations come with 1, 2, 3 or 4 numbers. Looking for a series of reg with sequential numbers? 3 letters, 3 digits, great combinations for square plates. 99 most popular first names and surnames in the UK. Three letters, 1, 2 or 3 digits, one letter.